Stream and download Red Lake rapper Thomas X's new EP, Have a Good Day. Thanks to a #SwayintheMorning mega cypher featuring Minnesota-based MCs Tall Paul and Knox, we just got put on to Thomas X. 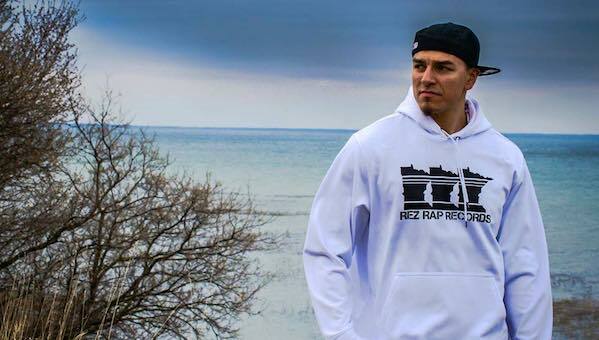 Part of the 100 Souls crew and Rez Rap Records, the Red Lake Anishinaabe MC is making moves and today he dropped his new EP, Have a Good Day. Stream and download it for free on his bandcamp and support underground emcees putting in love and much work to support true hip-hop culture and Indigenous pride. Have a Good Day is on some throwback to the boom bap era vibes, without dwelling in nostalgia. Thomas X kicks his laid back cadence with confidence and persona, weaving personal stories of struggle and survival over solid production from Mike the Martyr. In the absence of institutional support and a larger urban scene, the Rez Rap crew has had to do it for themselves—building their production and audience brick by brick, listener by listener. Thomas X holds it down on that front, filling the EP with bold declarations of love for his people, family, and homeland, while standing up to represent his nation and community. Salute to all the Indigenous lyrical warriors on the come up. Now give Thomas X a listen.